In the previous articles of this series (see the index at bottom), we discussed the characteristics of the SQL Execution Plan from multiple aspects, that include the way the SQL Execution Plan is generated by the SQL Server Query Optimizer internally, what are the different types of plans, how to identify and analyze the different components and operators of the Execution Plans, how to work with the plans using different tools and finally, tuning the performance of simple and complex T-SQL queries using the Execution Plans. In this, the last article of this series, but not the least, we will discuss where the Execution plan is stored and how to save it for future use. The process of generating the SQL Execution Plan is not an easy or cheap operation, in terms of resources and time consumption. For more information about the Execution Plans generation process, check the SQL Server Execution Plans Overview. For each submitted T-SQL query, the SQL Server Engine stores the generated plans in a special section of the memory called the Plan cache, to use it whenever the same query is executed again, eliminating the overhead of creating a new SQL Execution Plan for the same query. 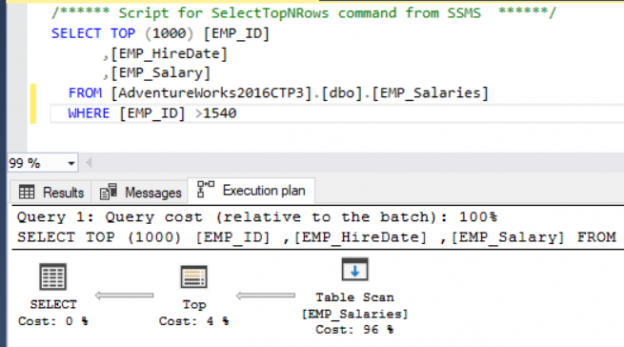 The story starts when a T-SQL query is submitted, where the SQL Server Engine will search for any Actual Execution Plan, for this query, that matches the estimated plan for the query, in the Plan cache memory. If a matching plan is found, the SQL Server Engine will use it to execute the query, otherwise, a new plan will be generated, stored in the Plan cache and used to execute the query. In some cases, the SQL Server Query Optimizer finds that using a parallel plan for that query is faster than using the cached serial plan. In this case, the optimizer will generate a new parallel plan will be generated and stored in the Plan cache for the same query. The SQL Execution Plan is also sensitive to different type of changes, that leads the query to be recompiled again. These changes include table schema changes, index changes, statistics update, large number of data modification or insertion in the table, or explicitly recompile the query using query hints or calling the sp_recompile function. If most of your system workload consists of queries that are executed once and never executed again, also known as Ad Hoc queries, it is better not to keep the plans for such queries and waste the Plan Cache memory resources. To improve the efficiency of the Plan Cache usage and reduce the memory pressure in such workload type, you can enable the Optimize for Ad hoc Workloads option, to store the SQL Execution Plan of the query in the Plan Cache at the second execution of the query. For more information about that new feature, check Saving the Plan Cache storage using the Optimize for Ad hoc Workloads option. The SQL Execution Plan will not be kept in the Plan cache forever, where the SQL Server Engine will remove the plan from the Plan Cache if the system requires more memory or the age of the plan, that depends on the cost of the plan and the number of times this plan is called, reached the zero value. The system process that is responsible for cleaning these aged plans is called the Lazy Writer process. SQL Server provides us with the ability to export the generated SQL Execution Plan as a sqlplan file, to send it as an evidence for the related SQL development team or use it in the future for performance comparison purposes. Or simply, double-click on the exported Execution Plan file from the Windows Explorer, and the plan will be opened in SQL Server Management Studio. At this point, we have reached the end of the SQL Execution Plan articles series. I hope the way these articles were presented made this important and complex subject simpler for you. Feel free to share any feedback or questions in the comments below.